As promised, I gave myself a night off last night and we had take-out Chinese food (moo shu pork and Mongolian beef, Yum!) Now back to cooking. There is a reason why we have Chicken Monday. It is a way of bringing us back to eating properly for the week. The protein decision is made. We only need to decide how we are going to put our dinner together. Since frying is never (except scallops) an option, there are lots of interesting ways to craft a dinner that is healthy and satisfying. I am resolute in trying to make interesting meals this year. So instead of the same-old same-old chicken, tonight’s dinner is somewhat more interesting. John sous vides the chicken and stirs up a 5.5 to 1 polenta. The broth for the polenta is flavored with bay and thyme and finished with minimal olive oil and butter. I made sautéed zucchini, bell pepper, onion, and garlic. Served with a tomato sauce, this was a pleasing plate. 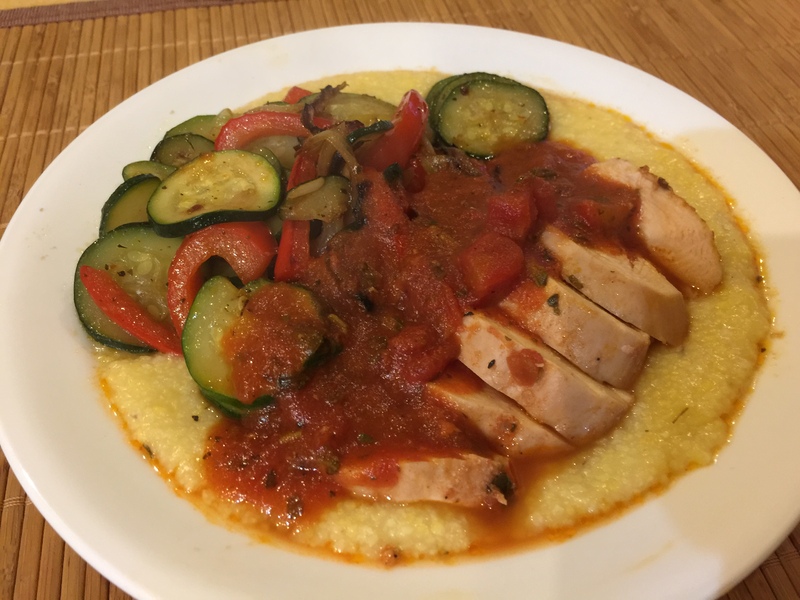 This entry was posted in Poultry, Vegetables and tagged chicken breast, polenta, sous vide, zucchini. Bookmark the permalink.